The California Department of Fish and Wildlife (CDFW) collaborates with the California Cooperative Fish and Wildlife Research Unit at Humboldt State University to better understand population dynamics of Chinook salmon, coho salmon, and steelhead trout within Redwood Creek in Humboldt County. The study area includes 117 miles of habitat that is available to anadromous (migrate between freshwater habitat for reproduction and saltwater habitat for growth) fishes of the salmon family (FIGURE 1). Among other populations in Redwood Creek listed under the Endangered Species Act, the population of Chinook salmon is listed as “threatened” and has been determined to be an important contributor to the California Coastal Chinook salmon Evolutionary Significant Unit (FIGURE 2). Figure 2. A. 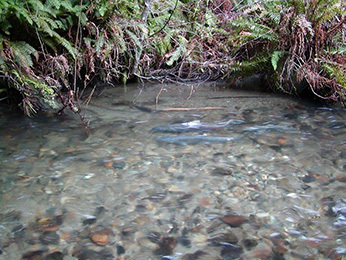 Adult male and female Chinook salmon on spawning on nest (redd) in Prairie Creek, tributary of Redwood Creek. Long term population monitoring is critical to our understanding of how weather patterns, habitat modification, and land-use changes affect salmon populations. With a better understanding of these linkages, CDFW can more effectively predict and make management decisions to protect and restore populations. In Redwood Creek, the Chinook salmon population has been monitored for 15 years. Over the years we have documented that the middle and upper reaches of Redwood Creek are important habitat for adult Chinook salmon spawning and juvenile rearing. 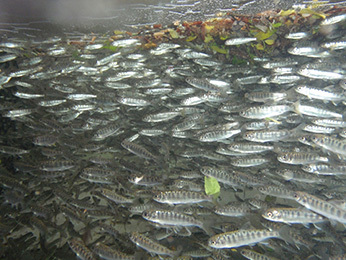 Over the last two years, information gathered indicate that habitat conditions for successful spawning and hatching is more abundant in the upper reaches of Redwood Creek and that accessibility to these prime spawning grounds has the potential to largely control Chinook salmon abundance for the entirety of the watershed. Recently, we have documented substantial population declines which appear to be due to the severe drought conditions of 2013/2014 rainy season (93% less than historic average flow), impacting the population greater than that which occurred during the milder drought conditions of 2012/2013. Monitoring data shows that with reduced rainfall and stream flow in 2013/2014, the number of adult Chinook salmon accessing the important habitat in the upper reach of Redwood Creek to spawn was substantially lower than it was in 2012/2013. The reduced number of salmon accessing the upper watershed was not a result of fewer salmon returning from the ocean to spawn, as 300 more (total of 3,500) Chinook salmon adults entered the creek in 2013/2014. This latest data is being collected by biologists through use of a combination of sonar cameras (also known as Dual Frequency Identification Sonar “DIDSON”) and rotary screw traps (FIGURES 3 and 4). The sonar cameras can “see” images of salmon migrating upstream during the day or night and during clear or muddy stream flows. Adult Chinook salmon enter Redwood Creek from September through January, the date of first entry dependent upon when the stream mouth opens to the Pacific Ocean. Humboldt State University operates one sonar camera in the lower watershed to count total number of salmon accessing the watershed, and CDFW operates a second camera in the middle to upper watershed to count the number of salmon accessing the upper reach. Likewise, these biologists operate three rotary screw traps to count juvenile salmon “smolts” migrating out of three different reaches of the stream into the ocean. Figure 3. A. Sonar camera (DIDSON) mounted on stand. B. DIDSON collecting video of adult salmon on Redwood Creek with adjacent weirs ensuring that salmon swim in front of camera. Photos by CDFW Michael Sparkman. Figure 4. 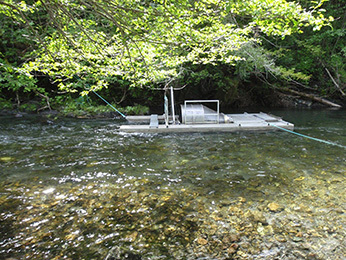 Rotary screw trap capturing out-migrating juvenile salmon “smolts” in the middle-upper reach of Redwood Creek. Photo by CDFW Michael Sparkman. During 2013 / 2014 migration season, only 84 adult Chinook salmon entered the upper-middle reach of Redwood Creek. That’s an average of 4.6 adults over 2 miles of creek. During the previous season, in comparison, when the sonar camera was operated, 500 adult Chinook salmon were counted in one day alone migrating into the middle-upper reach. 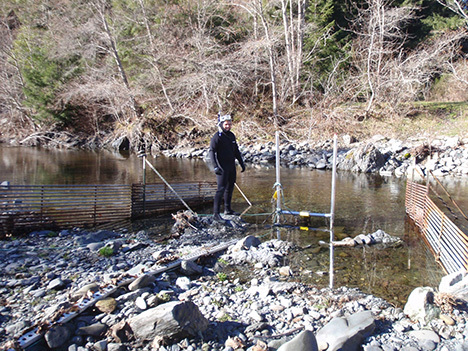 Smolt production during 2013/ 2014 from upper Redwood Creek was only 1% of the total number of the previous season, and lower Redwood Creek also produced significantly fewer Chinook smolts. The low number of smolts produced in the upper basin in 2013/2014 is thought to be due to later arrival and spawning of Chinook salmon, restricted spawning areas, and the low number of adults per mile of stream. 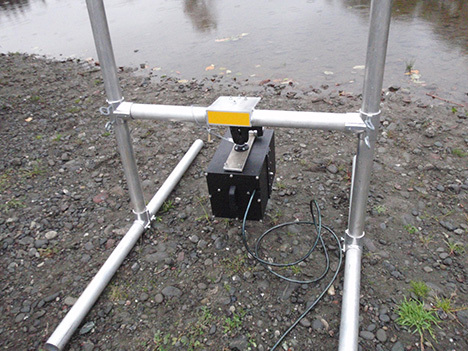 Provided there is funding, CDFW intends to continue monitoring efforts to address long term biological and environmental variability of Chinook salmon populations using sonar cameras and smolt traps at several sites within the Redwood Creek basin. This level of monitoring will elucidate how rainfall and stream flow patterns affect migration, survival, and population abundances. By knowing how and why adult Chinook salmon are responding to changes in the environment, we can better manage the population and habitat for continued existence into the future. Figure 1. Map of Redwood Creek watershed with field sampling sites.